One of the best things about living in the Coachella Valley is the "desert lifestyle". Warm sunny days perfect for outdoor activities such as golf, tennis, cycling and many others. Clear, mild evenings great for relaxing with friends and family. 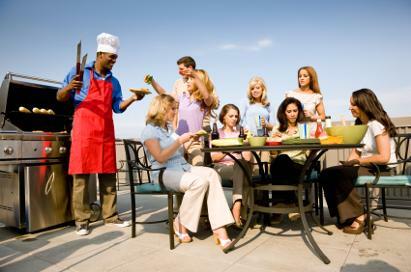 Backyard barbecues, get together's, and cocktail parties on the patio. 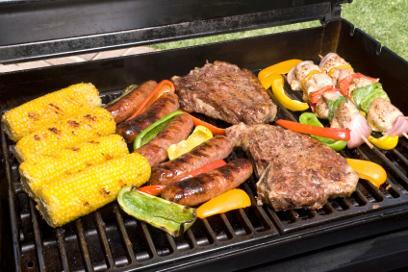 The Grill Man can provide you with everything you need to make the most of your "desert lifestyle". Quality, American Made grills designed to perform and made to last! We can also put a new grill into your existing island, we specialize in grill retro-fitting. will allow you to extend your entertaining onto the patio. New grill installations and retrofits. Built-in stainless steel grill cleaning. We are trusted by Lynx Professional Grills, one of the most prestigious grill manufactures on the west coast, Weber/Stephens, arguably the most well known name in outdoor grills, Vintage Outdoor Grills, Kalmazoo, and Bull Outdoor Grills to provide their customers with quality warranty work and great customer service. Our knowledge and experience are second to none. We serve the entire Coachella Valley, Palm Springs, Desert Hot Springs, Cathedral City, Thousand Palms, Rancho Mirage, Palm Desert, Indian Wells, Bermuda Dunes, La Quinta, and Indio. We have many satisfied customers in Big Horn, Trilogy, Traditions, PGA West, The Citrus, The Hideaway, The Lakes, Palm Valley, Forest Falls, Desert Horizons, and all of the country clubs and gated communities.